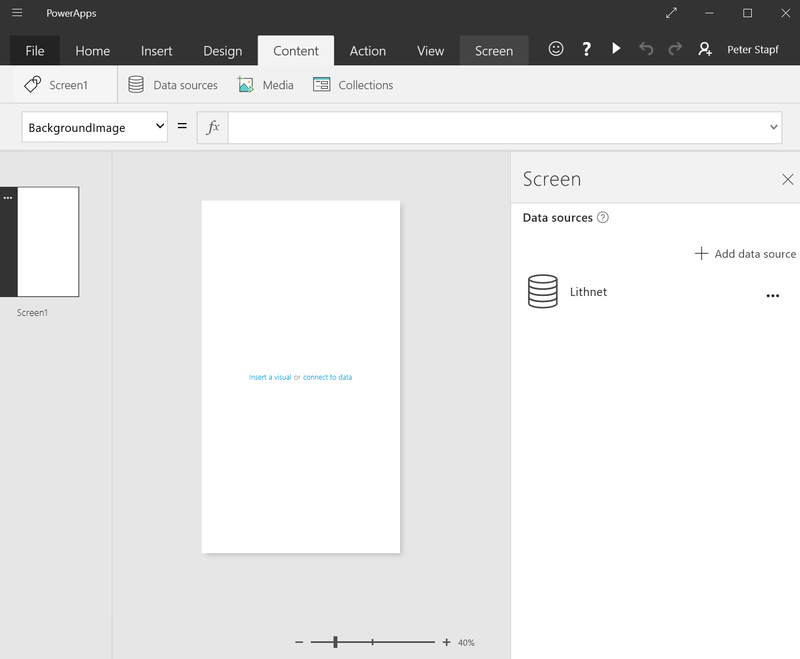 I recently take a look into the Preview of Microsoft PowerApps and also Microsoft Flow. 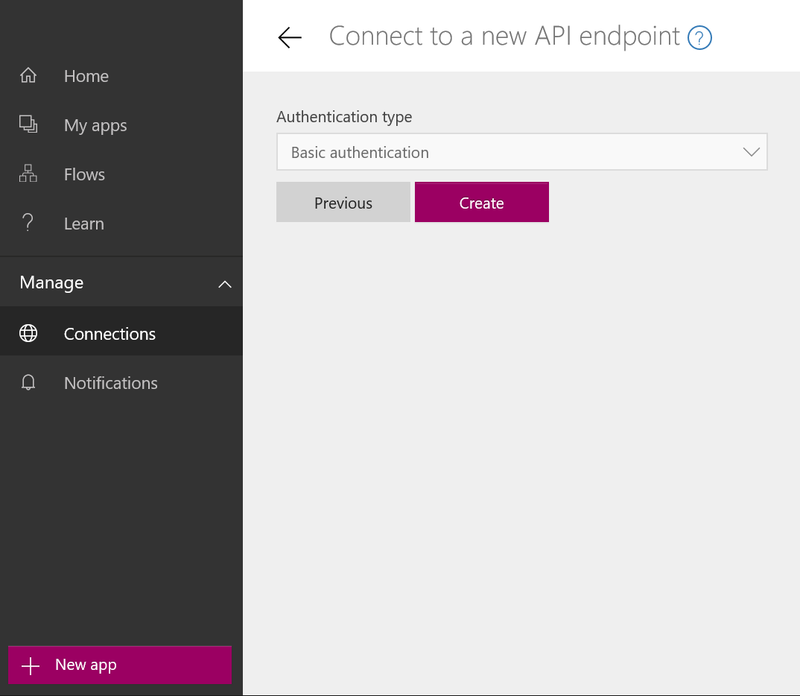 There are some really cool examples and templates for PowerApps and I also like that it is possible to create custom API connection for nearly every RestAPI. When thinking on MIM we have that great Lithnet RestAPI from Ryan Newington and so a new project was born in my spare private time. Here are the results. 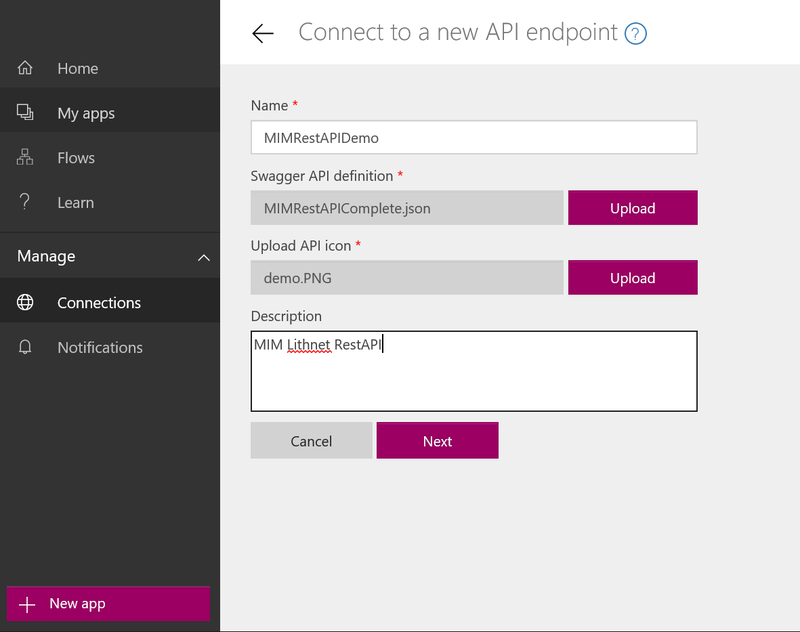 In order to create a connector in PowerApps for custom APIs we need a Swagger JSON definition file which describes the API (calls, parameters and so on). You can easily create such a definition file with the Swagger Editor in YAML. (Don’t worry, I’ve done this for you). If you want to take a better look to the API definition file, go to http://editor.swagger.io and paste the YAML or JSON file of the Lithnet RestAPI into the editor. You will find both files at the end of the post. Click on “+ New Connection” which leads you to the page with all possible default connectors. Click on “Custom”. All your custom API definitions are listed here. Click on “+ New custom API” in the top right corner. You can now enter the information for the API definitions. Enter a name (ex. MIMRestAPI) upload the this JSON file, a PNG image icon and also a short description and click “Next”. Since the Lithnet RestAPI by default uses Basic Authentication and this is also defined in the JSON definition file you see the selection of that auth method. Because this is the only method you cannot switch the mode. Click “Create”. 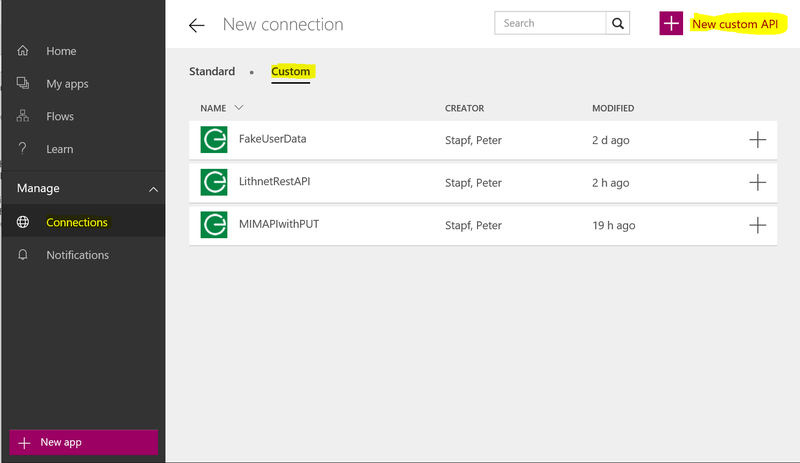 You now have a new connector definition for the MM RestAPI. 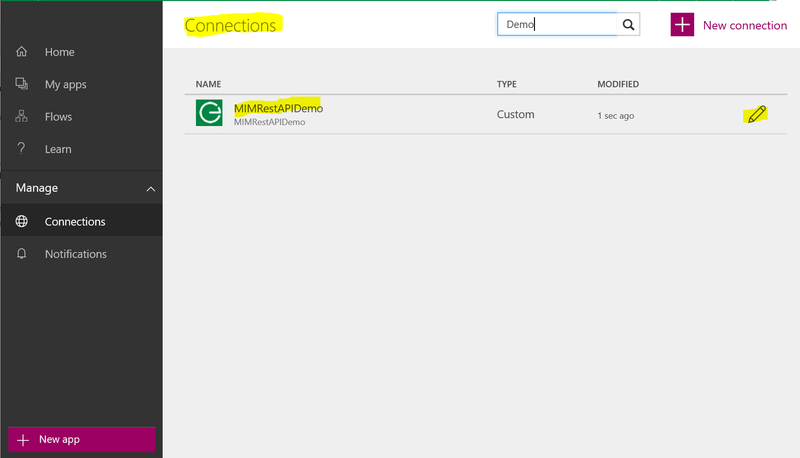 Next is to create a now connection from that connector with the authentication data so click on the “+” on the right of the connector. 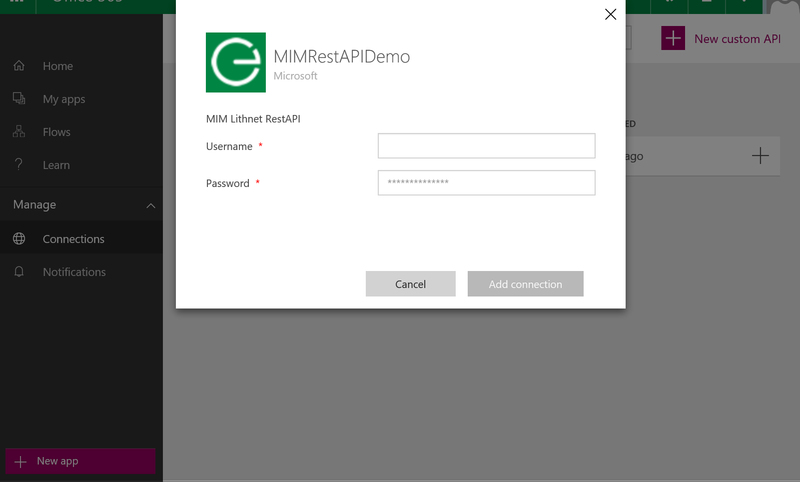 Enter the authentication data for the RestAPI for example a MIM Portal Admin. 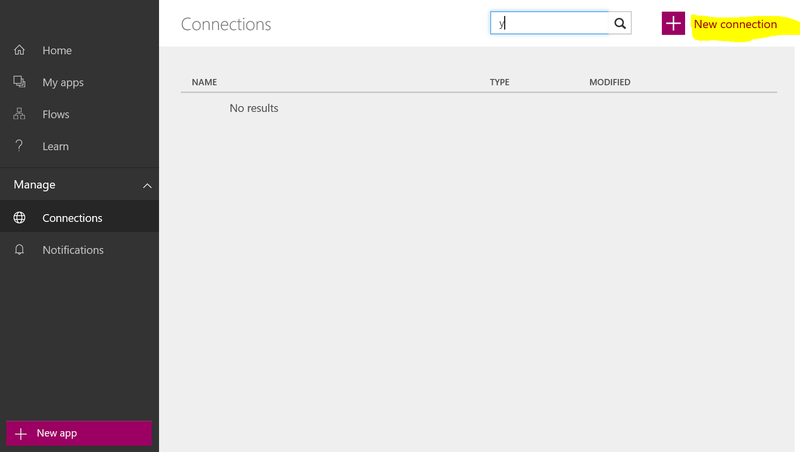 You finally have a new connection ready to use in either PowerApps or Flow. You can change the authentication data at any time on the edit mode of the connection. 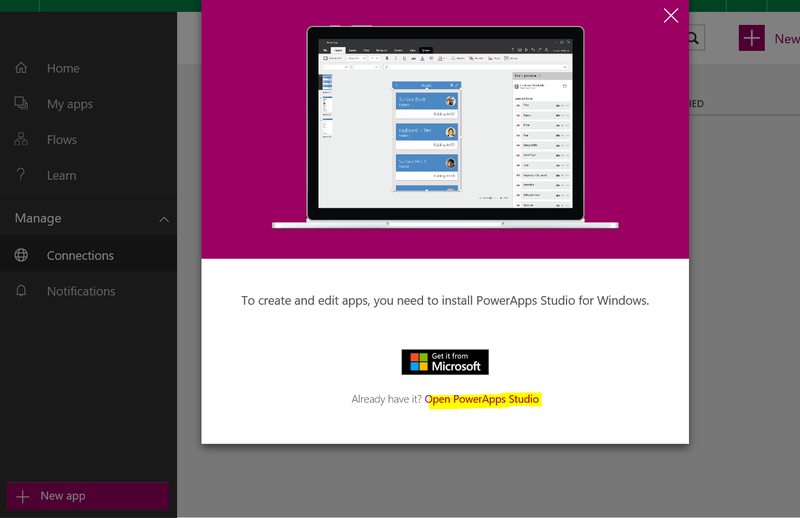 Click on the “+ New App” button and install the PowerApps Studio to design an application of you not done this before, otherwise start the PowerApps Studio. Click on “New” to create a new App. 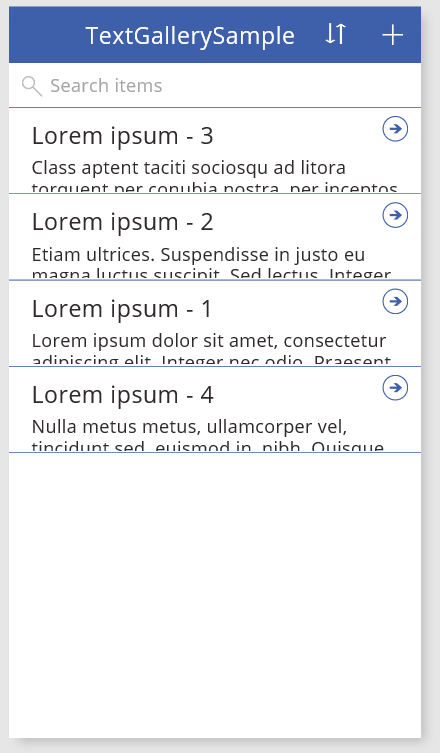 Choose the “Phone layout” from the “Blank app” template. You now see the App MainScreen where you can design the app, and I say design as no real development skills are necessary to build an app. 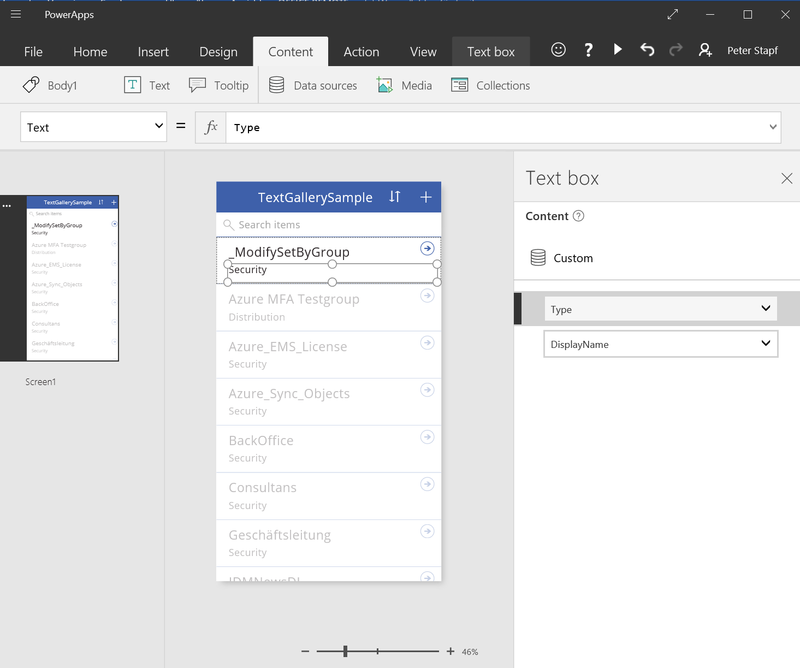 Let’s do a simple demo to show some data from the MIM API in the app. So click on “Connect to data” on the white page of the App and after that on “Data Sources” on the above menu. Click on “Add data source” from the sliding in action menu. 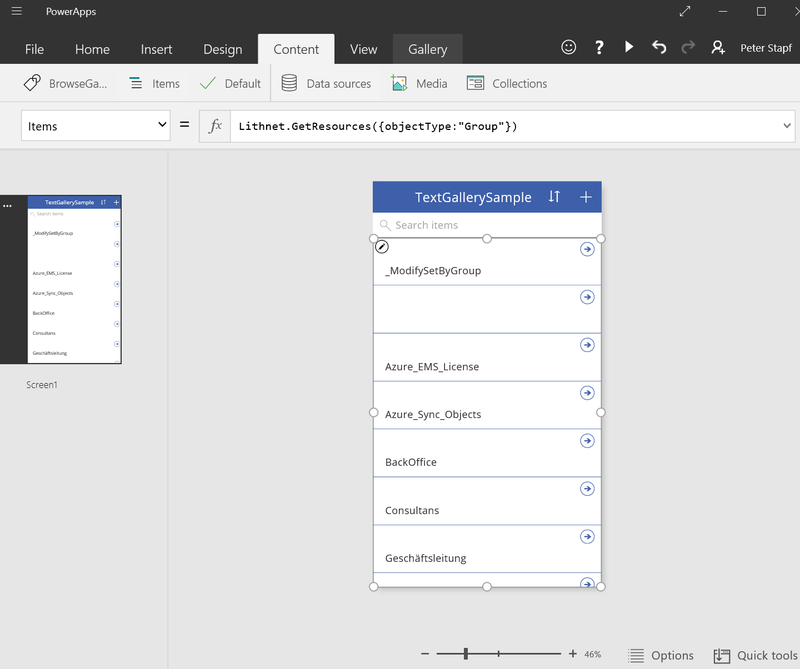 You now have the Lithnet data source connected to your app, “Lithnet” is the name defined in the “title” attribute of the JSON definition file. 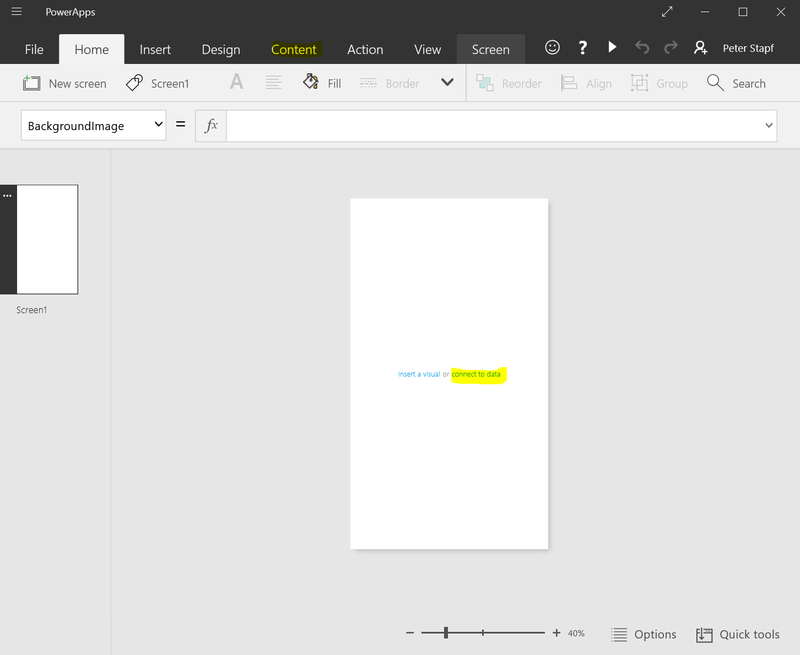 And we are done for a first demo, you can now save your app to Azure and let it run in either the Studio or the website (http://web.powerapps.com). 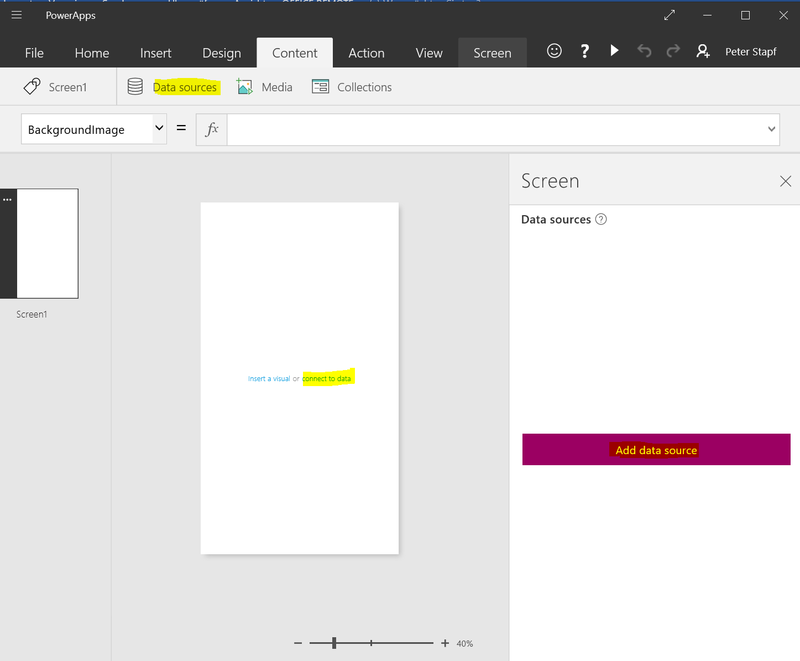 Currently there is no PowerApp for Windows 10 Mobile (very very sad, all think are last for either Edge or Windows Phone) but you can download PowerApps also for iPhone and Android. 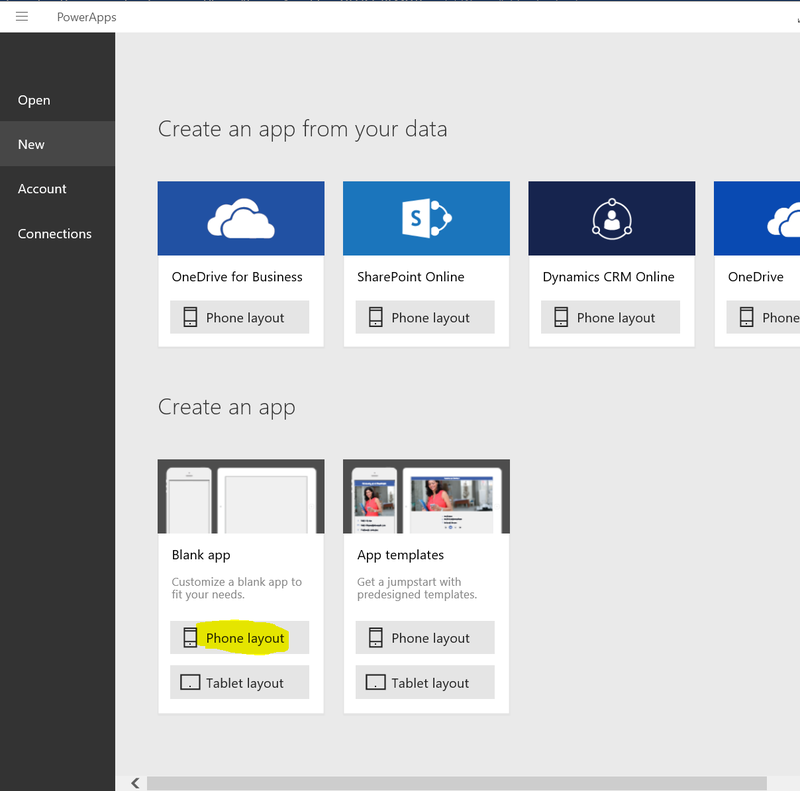 You can also share the app to everyone in your organization for either “use” or “use and share”, but don’t forget to also share the connector (not connection) on the custom API connector page. "description": "HTTP Basic Authentication. Works over `HTTP` and `HTTPS`"
"description": "The request was malformed or incomplete"
"description": "The user was not authorized to perform the operation"
"description": "The specified resource could not be found"
"description": "An internal error occured"
"description": "The operation completed successfully"
thanxs Ike, feel free to do so. BTW I got also a speech input for working with Cortana and Bing Speech (Cognitive Services). Its just a small PoC but I will do a post next week I think. 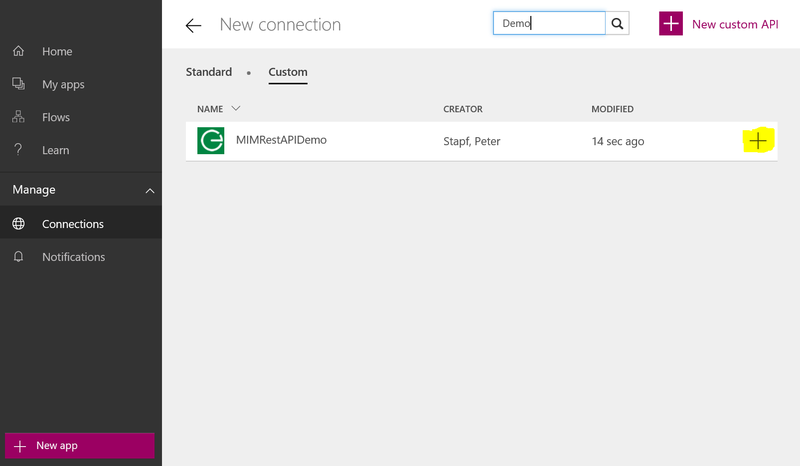 This is an brilliant post from Peter on how to create apps and integrate with MIM. Using RESTAPI and Json. There are so many ships that one can build on this foundational post from Peter.